Keep your nails in the best possible condition at all times with the practical, compact and hygienic Neem Nail & Cuticle Pen; Whether at home or out and about, your nails can benefit from a mini manicure treatment whenever you have a few moments to spare. When pressed gently, the fibre applicator releases just the right amount of Neem Nail & Cuticle Oil. Arachis Hypogaea (Peanut) Oil, Melia Azadirachta Leaf Extract, Anthyllis Vulneraria Extract, Prunus Armeniaca (Apricot) Kernel Oil, Chamomilla Recutita (Matricaria) Flower Extract, Fragrance (Parfum)*, Linalool*, Limonene*, Geraniol*. This pen is great. The oil works very well on my nail and cuticle and so easy to use. Also, I can take it wherever I go with me. The best nail product around! This product is an essential part of one's beauty routine. A really useful professional aid in instantly improving ones nails. So handy especially when travelling. Easy to use and with a pleasant fragrance, the Cuticle Pen is helping my ageing brittle nails. Only downside is that there is no local stockist. To keep your Neem Nail & Cuticle Pen looking clean, it comes with three spare tips, which are easy to replace. Nail polish can discolour the applicator tip. The Neem Nail & Cuticle Pen is also ideal for your toe nails. 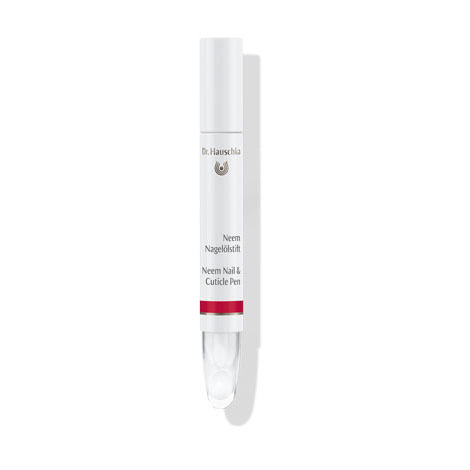 Treat yourself to a Dr.Hauschka Hand Treatment from a Dr. Hauschka esthetician.